Today is an equal opportunity Monday! We all get the same 24 hours to live. We all get the same opportunity to improve ourselves today and everyday. We all get the same amount of time to get our steps in today. We all live in the same United States of America. We are all alive today. There will be challenges in your life and the question is not if those challenges come. The question is when those challenges come what are you going to do? Everyone goes through hard times. When you go through hard times what kind of person are you going to be? Are you going to fight back with everything you have? Or are you going to give up and quit? The choice is up to you. Listen to the winner inside of you. The winner will take you down the right path in your life. Equal opportunity Monday – Lets do this. Game on!! Hey guys – I hope you are a little excited about today because I am. 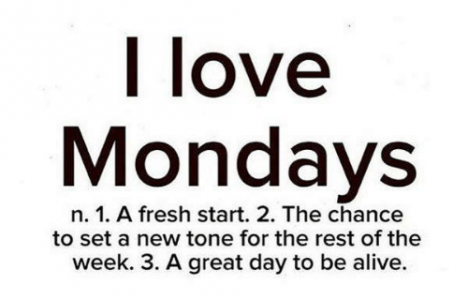 It is a brand spanking new super fresh day and a great fresh start to your week and to your life today. For instance, you do not know what this day holds for you. Do you? Can you predict the future of how many more days you will live on this planet? Last time I checked I did not know anyone who knew exactly how many more days they had. So this day and this moment is all we have right? Are you with me? So today STEP into your most authentic self and be your most awesome self. Be who you were born to be. Keep on doing your thing and exercising and winning in life.